So you’re sitting down in your office, having a cup of coffee and talking about your workday with your coworkers. You each discuss the watercooler moment of the day and exaggerate the frustrations of your last task. Everything seems normal. Your coworkers are normal people like you, right? When out of the blue, one of your coworkers asks if you remembered your sunscreen. How… odd. That is, if you were playing any other game. In Spyfall, weird questions become the norm. So is it any good, or should it be left in the Budget Bucket? About two years ago on the PC gaming front, Electronic Arts (EA) released the videogame Battlefield 4 on the market. It came mostly in direct competition with the ever-popular Call of Duty franchise at the time. 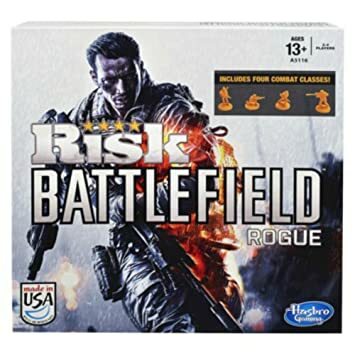 I’ve been a PC gamer at heart for a long while, but this is a boardgame and role-playing game website, so I’ll do my best to skirt around that mindless nerdrage and instead focus on something that came out around the exact same time as the BF4 release: Risk Battlefield Rogue. What is it with Battlefield and soldiers sprinting at the camera while on fire? On the surface, a gamer would be forgiven for mistaking this game as a blatant piece of piggy-back marketing. And that gamer, for the most part, would be absolutely correct. This game has very little in common with its boardgame namesake, Risk, to which I’m rather partial given that (aside maybe from Monopoly) Risk was probably the very first bona-fide board game I played with my father that had tactics stretching beyond Chutes and Ladders. Given these reasons, I’m sure most would forgive me if I approached this game with a roll of my eyes while thinking, Good God, Hasbro, what have you done?! So. Risk Battlefield Rogue. Now that you can find it for eight bucks on Amazon or in the budget bin at your local Target, is it any good whatsoever? Or should it be left in the Budget Bucket? Unboxing: Cthulhu Hastur La Vista, Baby! June 27, 2015 Board Games, Unboxing Comments Off on Unboxing: Cthulhu Hastur La Vista, Baby! In today’s unboxing video GM Hexelis opens a copy of Cthulhu: Hastur La Vista, Baby! from the folks at Twilight Creations Inc. Check out our new video where GM Hexelis unboxes the Doctor Who Risk: Dalek Invasion of Earth board game. Special thanks to Lodge member James for providing the goods.